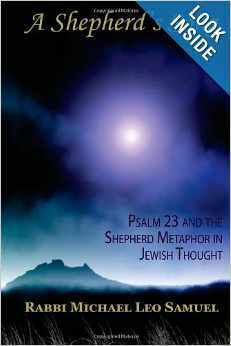 Order your copy of Rabbi Michael Leo Samuel's new book, A Shepherd's Song: Psalm 23 and the Shepherd Metaphor in Jewish Thought. I was born in San Francisco and grew up in the Bay Area. I am the child of a Holocaust survivor; my father, Leo Samuel (z”l ) descended from a long line of rabbis who lived in a part of Europe that used to be part of Czechoslovakia. Despite his passing, I feel that my father continues to be my inspiration and mentor. Some years ago, I learned that my mother was related to some highly regarded rabbis of the 19th century, such as R. Yisrael Salanter, and R. Yitzchak Elchanan. This surprising discovery leads me to believe most of us probably have more rabbinic lineage than we realize. However, ultimately each of us must establish our own lineage, and become worthy ancestors for the future generation. I have three sons (two of whom, are just beginning) who are in college right now, and I pray that they will be successful in their creative endeavors. My rabbinical education benefited from studying at several Orthodox seminaries, graduating from the Lubavitcher Seminary with advanced rabbinical degrees in Yoreh Deah and in Yadin Yadin, finally becoming a rabbinical judge. In the early years of my career I taught Talmud and Bible at various Torah u’Messorah Day schools in New York and New England. Teaching at any and all levels and ages continues to inspire me. Judaism honors the great questions humankind has asked since the dawn of civilization. All traditions deserve to be questioned, if they are to be properly understood. I do not believe that God placed us in this world simply to be pious automatons. The human mind is a wonderful gift. To properly worship God, we must engage in critical thought and self-reflective thinking. My experience has taught me that a strong faith can be integrated with modernity, without having to give in to blind faith, dogma and narrow-mindedness. Since my time spent as a rabbinical student in Israel, I have been involved with Zionist organizations and I continue to believe that it is very important to be an articulate spokesperson for Israel–especially now, as enemy nations are committed to her destruction. A strong Israel is essential for Jewish identity in the Diaspora; all of us must do our part to maintain Israel’s strength and security. One of the great problems of our time is the tendency to subordinate our capacity for religious expression to the forces of denominationalism that govern modern Judaism. This is not just an issue that adversely affects Orthodox communities; it also afflicts Conservative, Traditional, Reform and Reconstructionist streams of Judaism. All denominations of Judaism must learn to purge themselves of the political intrigue and lust for power that govern so much of their infrastructure. We need to become authentic and take personal ownership of our faith so that we might instill this enthusiasm to our children and those around us. Before we can become a light unto the nations, we first have to rekindle that light of faith within ourselves. Today’s Judaism must reclaim its sense of heart and soul. We possess a wonderful tradition that reflects diversity and creativity. The humanistic element of Judaism that celebrates the gifts of the human spirit abound everywhere. I am convinced that such an approach will do much to heal the wounds we have suffered as a community since the time of the Holocaust. Since my days as a yeshiva student in Israel I have enjoyed writing immensely, and published my first book, The Lord is My Shepherd: The Theology of a Caring God based on my doctoral thesis of Psalm 23. Over the last decade, I have been working on a new multi-volume commentary of the Pentateuch that is finished and is in the process of being edited. It is approximately 15 volumes long. Volume 1 entitled: “Birth and Rebirth Through Genesis: A Timeless Theological Conversation” slated to be available in the spring of 2010. Unlike most commentaries that have appeared in the last two hundred years, this new work promises to engage the reader on a myriad of different levels and will stretch the mind, heart, and imagination of the reader.